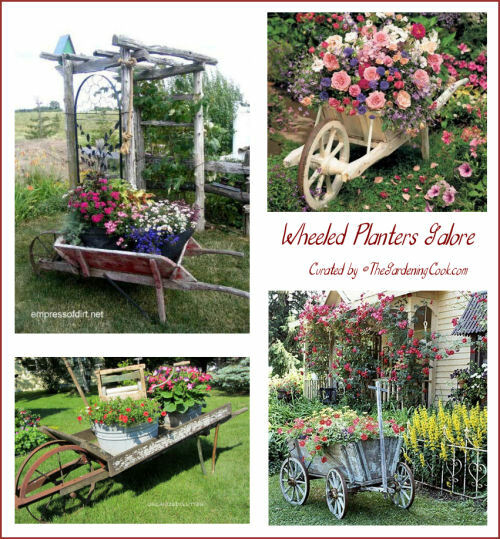 There are a lot of planters for sale at garden centers, but you could break the bank buying many of them. Why not see what you have handy that would make great planters? Old wheelbarrows and wagons fit that bill perfectly. 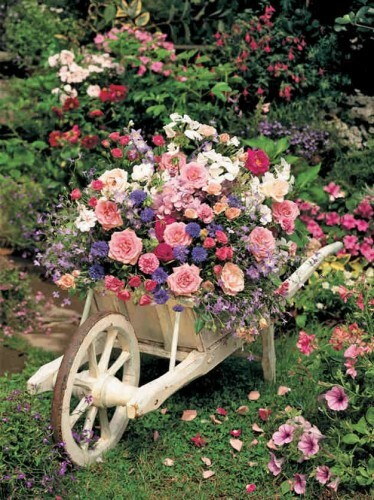 Wheelbarrow planters are one things on my bucket list of must do gardening ideas. I have been looking for just the right old fashioned wheelbarrow for months. I want to add them as focal pieces in my perennial garden beds. Until then, I can dream and window shop on the internet! I have a cottage garden and these planters would fit in just beautifully. 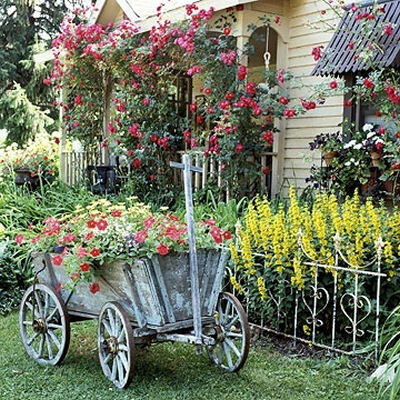 Many of them have a cottage chic appeal and fit into my garden beds in just the right way. 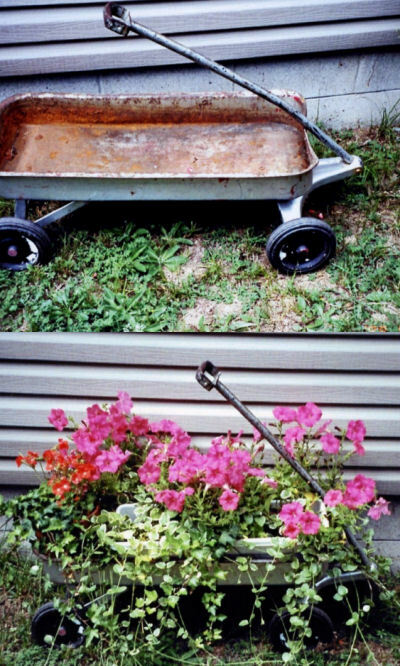 One of the fans of The Gardening Cook on Facebook, Diamond Victoria shared this great before and after photo. She says: “When one of my grandsons was very little, (I think he was about 7) he brought this wagon home. He told his mom that is was for his grandma ” me “. When my daughter asked him where he got it, he said from the people’s garbage across the street, and wanted me to have it because grandma said she loves junk! This still is one of my most treasured pieces of junk!” What a wonderful planter this must be for you and your grandson. 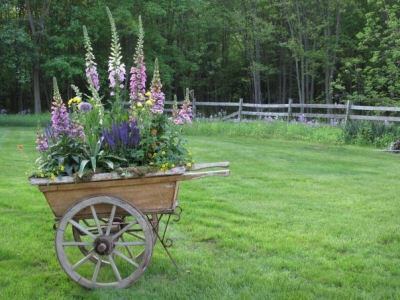 I love the way the lupines and snap dragons give height to this farm styled wooden wheel barrow planter. Just perfect for a lone spot in the garden. Shared via Pinterest. 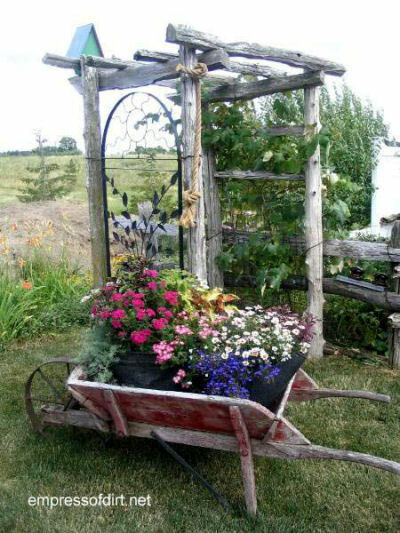 This four wheeled goat cart still makes a great planter. The red wave petunias and yellow daisies are a perfect combination. Shared from BHG. 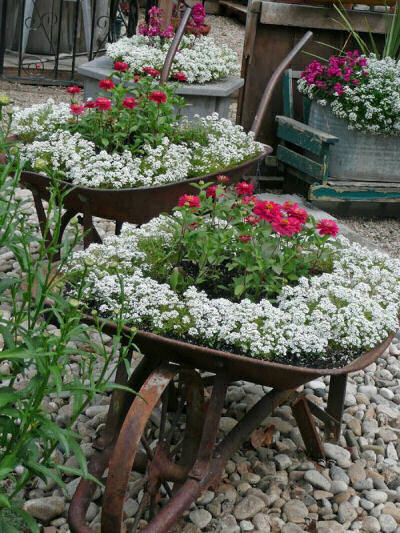 These vintage wheel barrow planters set off the sweet alyssum that is over flowing so nicely. Shared from Our Life in Idaho. 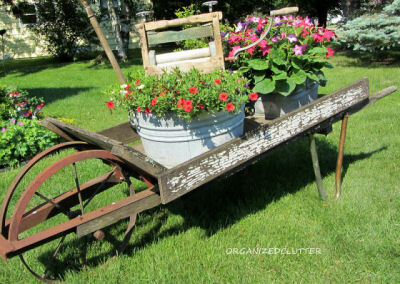 My friend Carlene from Organized Clutter has made a wonderful planter by using this old wooden wheelbarrow, adding couple of galvanized tubs and finally a sweet vintage washtub wringer. What a great combination! For more creative gardening ideas, please visit The Gardening Cook on Facebook. ← Favorite Amaretto Cocktails – Almonds at Cocktail Hour!